Unmanned shuttle orbit: Air Force craft returns. 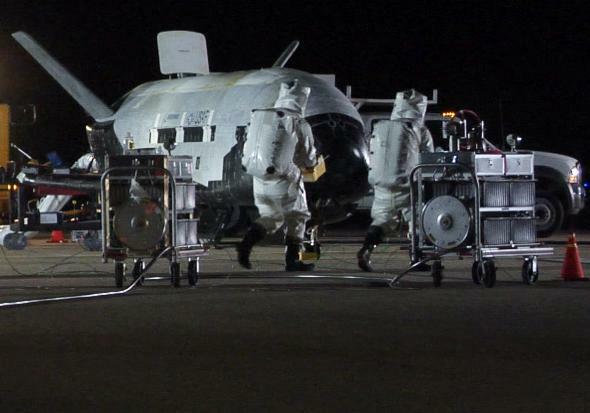 The X-37B in a photo from 2010. The X-37B program has been an orphan of sorts, bouncing since its inception in 1999 between several federal agencies, Nasa among them. It now resides under the air force’s rapid capabilities office. The plane that landed Friday is one of two built by Boeing. This is the program’s third mission, and began in December 2012. The plane stands 9.5ft tall and is just over 29ft long, with a wingspan under 15ft. It weighs 11,000lbs and has solar panels that unfurl to charge its batteries once in orbit. Exactly what the X-37B was doing in orbit for 674 days is classified, though experts* speculate it was looking for Godzilla.